I’m feeling a little tickle in my throat today. A little dryness. A slight cough now and then. I hope I’m not coming down with a cold. Vitamin C on a regular basis is a traditional way of keeping your resistance up, but here in The Bahamas, you can walk right into your garden and find something that will make you feel better in no time: Cerasee. 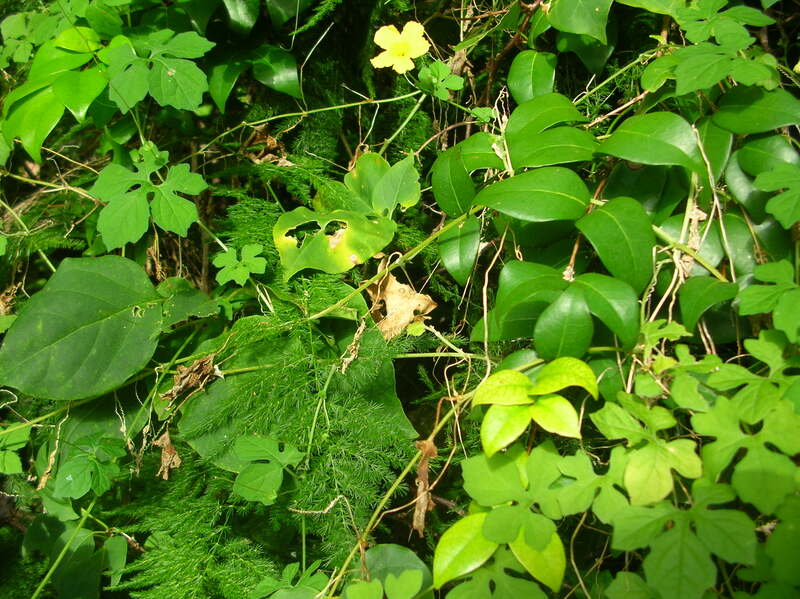 Can you see the cerasee growing like a vine in this tangle of green in the picture above? It’s the one with the yellow flower and the five-fingered leaves. Taking some of the cerasee leaves, stems, flowers, (and even seeds!) and pouring boiling hot water over it and letting it steep to make a tea infusion is said to be one of the best cure-alls for whatever ails you. It’s known as a blood purifier, blood sugar stabilizer, skin soother, immune system enhancer, and just all round tonic for keeping you strong and helping you “live long”, as they say in the islands! The wise elders in The Bahamas recommend a cup a week to keep you going. It is a nasty tasting medicine — I have trouble imagining how anyone drank enough of it in the first place to realize it had therapeutic properties — but it is a long standing, sworn-by, tried-and-true remedy recommended by countless 80 and 90-somethings in The Bahamas. I’ve given up on putting honey in it to kill the taste. It doesn’t really help. You’ve just gotta down the bitter brew. It doesn’t taste like Paradise, but cerasee’s body-boosting abilities do make it a true heavenly gift if you like living well. I’ve thought myself too busy to brew up a batch these past few weeks, and you see what happens?!! Okay, I’m going to take Mary Poppins’ advice and maybe add just a spoonful of sugar … augghhh … To your health! This entry was posted on May 18, 2010 at 1:45 pm and is filed under favorite things, Garden, The Bahamas, wonderful ideas. You can subscribe via RSS 2.0 feed to this post's comments. haven’t heard of that particular bush medicine … perhaps another reader will know something … thanks for stopping by! I miss taking my cerassie every day. However, have they done any medical books explainging the DNA orgian yet? i suffers from scars on my lungs which make it hard some to breath, but a glass of cerasee allow me to breath clearly. Glad to know cerasee helps lungs too … breathe easy and thanks for stopping by the blog! I recently moved to Fl and I bought a house that just happens to have Cerasee growing rampantly. I would like to make tea but was told that there is a portion of the plant that is toxic to consume. Does anyone know which part? I don’t want to die from it! I haven’t heard of anyone here actually consuming the plant … those elders I have talked with merely put leaves, vine and all, into a pot and pour boiling water over it to make an infusion, which is drunk as a tea (often with lots of sweeteners added; it’s a bitter brew, so that’s what I do!). My husband’s mother lived to 94 and I’m told she drank one cup of cerasee tea a week. Many swear by its benefits. I don’t know of anything that’s 100% safe for everyone. Again, this is not intended as any kind of medical advice or endorsement, simply my own experience, and now sharing what I’ve read. Thanks for asking the question though. There is a link in one of my earlier comment replies that notes a dried leaf cerasee tea you can order from Amazon, if you want something that’s already prepared. (BTW, I don’t benefit from that link, am merely passing it along!). Thanks for stopping by the blog. To your health! Add a little salt and lime to it, the taste won’t be as bitter after you boil the cerasee. Do not add sugar, sugar will make it really bitter.